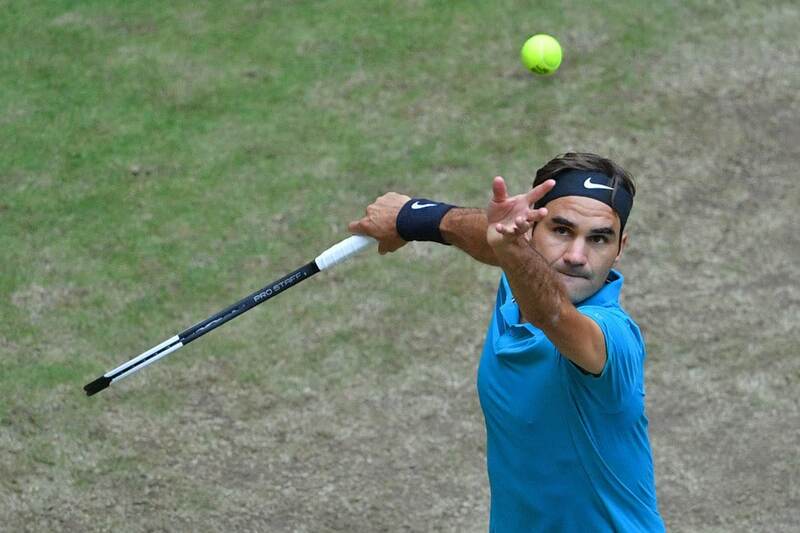 Roger Federer is into the Gerry Weber Open semi-finals after coming through another test this time at the hands of in-form Matthew Ebden in Friday's last eight clash. Less than 24 hours after digging deep to see off Benoit Paire the Swiss again was made to work hard, recovering from 3-5 down in the second set to prevail 7-6(2), 7-5 in 88 minutes. Ebden won the toss and elected to serve, holding to love to kick things off before Federer matched him to level at 1-1. From there both players began to roll through their service games, Federer in particular holding routinely. In game seven Roger fashioned his first break point but Ebden came up with the goods to hold. The Aussie then fought off another deuce game and we were soon into a tie-break. Into the breaker and Roger came up with a sick return to get an immediate mini-break en route to establishing a 3-0 lead. Ebden won his next two service points to stay in touch but Roger moved through the gears, taking advantage of a double fault at 5-2 to rip another backhand return on set point to take it 7-2. Roger started set two with a love hold and immediately had two break points. Ebden erased them both and a third later in the game to hold for 1-1. In game three the Swiss slipped to 15-40 and although he was able to save the first, a 25 shot rally went the way of Ebden as he broke for 2-1. A sweetly timely pass in the next game allowed Fed to set up two break points back and he converted the second to get back on level terms. However, after holding to fifteen for 3-2 and a failed SABR in game six Roger again dropped serve, handing Ebden the break with two wild forehands and then losing the breakpoint by failing to put away two overheads. The current world number 60 then held for 5-3 but couldn't get the job done at 5-4 as Roger went for broke on his return to break to 15. A 65-second game then put Fed up 6-5 and he won four points in a row in game twelve to break and move into the semi-finals. I felt like I had to push myself a little bit in the match today, it didn't come as easy as it does as other days. Potentially you get a little bit more frustrated when you feel a bit tired but at the end of the day I think I can take a lot of positives out today's match the semi-finals. Once you reach the semi's you can see the light at the end of the tunnel, that the tournament is coming to an end which helps find that bit of extra energy. A workmanlike performance here from Roger against an in-form opponent who had already played 13 matches on grass this season before taking to the court today. Ebden's game translates nicely to the green stuff and he showed some great net skills to ask Roger a lot of questions throughout both sets. The first set was close but you always felt like Ebden was the one having to work harder to hold serve throughout so Fed deservedly bagged the tie-break. The second saw Roger's level drop a touch and Ebden didn't let up and could have easily taken it three. But I liked Fed's response after dropping serve at 4-5, rather than look like the world was conspiring against him he summoned a bit of extra energy and hit over every backhand return to break. Nothing spectacular and he said in the press conference he felt a little tired but it was just another hard working match where his quality shines through when required which is why he's into the semifinals. Based on his two previous matches I would guess Kudla will test Federer again tomorrow but he's much more of a baseliner than Ebden so I think Fed handles him in straights assuming he's not feeling too leggy from playing quite a few matches over the last two weeks. Made to work out by Ebden who played some decent stuff but Fed put on the afterburners after dropping serve at 4-4 in set 2 and ran through the next three games to progress. I think we are both tied in second with 5 wins. Only Emerson ahead. And BTW, you’re third in the all-time leaderboard, so a bit surprising (for me) that you think it’s your first win this season. ? Loads of unusual miss shots from Fed but his champion’s mentality put him through in the end ! Yup I liked “Fed’s response after dropping serve at 4-5”, too. Lot’s of tennis/blog in a short space of time, but keep going for 2 more days, both Fed and you Jonathan! When it gets to saturday semi final day you can see the light at the end of the blogging tunnel. Had friends to lunch and of course they arrived just as the match started?So I only saw the first game and match point.Thanks for the write up Jonathan. Just watching Baptista Agut playing Khachanov.I am afraid the latter will win,unfortunately. I can’t see Khachanov being that great on grass, pretty extreme grip. I know it makes less of a difference as they bounce higher these days but still a bit of a disadvantage. The main things that worries me is the time of tomorrow’s match. Very early, pasta for breakfast. I leave for two days for work and Fed wins 2 consecutive matches… Yeah yeah yeah… just another semi-final tomorrow to start the week-end with… PeRFect ! My seminar took place in the “Pays Basque” where the “pelote basque” is the regional sport. In every village you can see a wall like this where children and adults can train and play. Thanks for the Paire and Ebden recaps, Jonathan ! The Paire match seemed great yesterday. Hope Roger won’t be too tired tomorrow… 2 more matches and the 99th in the pocket … and the pleasure to see that ugly greenish earthenware crockery in Swiss hands ? 2-1 SUI although Serbia should have had a penalty, wrestling match in the box. I knew Ebden went to the net often in this match, but had not realised it was 44 times in 2 sets. I enjoy net play and would have enjoyed this match more if I weren’t so stressed during it. I hope Fed has a nice, easy win tomorrow, so his fans can relax while watching the match. Served and volleyed quite a lot. Yes Feds matches seem to be getting earlier and earlier.Never seen Kudla,he is obviously playing very well.So we will have to see. Thought Fed played ok. Ratio of winners to UFEs looks good, but his attention wandered at times against a very dull opponent. Ebden despite being a good volleyer is not exciting to watch, and I never felt Fed was in danger even when he dropped serve. Just had to up his level each time to break back. Ivan is so good in Fed’s box, just does enough for his man. Good energy. Onward to the SF, a step nearer no 10! I thought the match was pretty fun. Ebden just goes about his business. They looked friendly at the net too after the challenge on MP. Seven matches already. phew. I know I might get smoked for saying but I think he s already played enough as a win or loss here wouldnt matter much (#1 to me, too soon to assess, we’ll see after US Open). A loss might actually give him an extra day of rest plus it would fire him up too for Wimbledon. Having said that two wins here ars great too. Here’s hoping Back to back tournament wins and 9 match winning streak hopefully doesnt wear him out mentally or physically (he did mention he felt a bit tired today). I’d reckon he would take some days off and keep it light next week anyway. Seems like a win-win situation here in Halle no matter what happens from now on, think he has enough match-play under his belt now, regardless. Good to see the net play but agree with Susie that it wasn’t as exciting to watch as, say, his matches with Mischa Zverev. Of course it always helps when I know he’s won before I watch! 1st serve % seems to be going the wrong direction… people have been saying it’s chilly in Halle this week, & I wonder what role that plays both in ball flight & Roger’s fluidity. Haha! I often don’t watch a match until I know for sure Federer has won! The live play is too anxiety inducing. Lumme, those highlights look fast! Mental walkabout during 2nd set, should I be worried that he is playing too much tennis? No more back 2 back tourney. Rog – please skip Sttugart next year. He had 11 weeks off, will be fine with a weeks rest before Wimbledon. Day off in slams makes all the difference. Been quite an interesting week I feel. I saw the point you made Jon in the previous post regarding some fans thinking Fed plays tennis in a vacuum, and I have to agree it’s like everytime Fed struggles he must be injured. If he wins the semi he’ll be playing 9 matches in 12 days after not playing for 3 months – that’s a lot. And, y’know, sometimes opponents play well. In a similar vein, Fed’s level has been a little weird to me this week. Probably because of fatigue, and partly I think the players he’s faced not allowing him to settle easily. 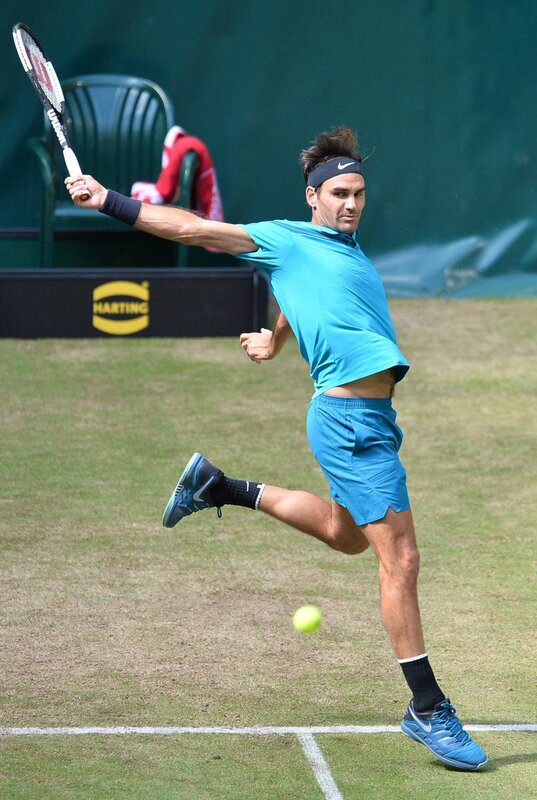 I see people on social media complain that Fed is struggling but to be honest I like it in Halle because it gives him a chance to play when really pushed outside of slams (this very nearly cost him against Cilic this year for example). Going into this swing he had lost back to back matches on a 3rd set tie breaker, and now he’s won two. That’s important, and it has given him a good workout overall. Yeah there has been sloppy points and games, but when he has really needed something he’s found it, like against Paire 6-5 and 7-6 down in the tie breaker and here 4-5 down. That’s what he needed I think – chances to win from those positions after the loss to Del Potro which is probably still frustrating for him etc. Had some fortune in the draw too, think he’ll probably face Coric in the final which will be a little tough probably but Zverev, Thiem and Nishikori all out. Would be nice to get the title from here but the main purpose is Wimbledon prep and I think that has more than delivered at this stage. Djokovic is starting to look good again, but I don’t know. I don’t think he’s got that sharpness about him – if Fed ends up playing him in Wimby I think as long as he doesn’t let their last few matches in slams get into his head (which I think he partly did after the many final losses) he should win. Long way off here of course but just something I’ve been thinking about while catching a little of Queen’s. Speaking of, I feel like it’s really slow playing. I don’t like the tournament much. You can see why Fed plays Halle for sure. Yes I thought Queens looked as slow as a clay court,no wonder Djokovic is doing well there.He is playing better but has yet to meet a really good player,I certainly wouldn’t put Dimitrov in that category.A final between him and Kygios would show us where his game really is. Like many Fed fans I am conflicted between wanting him to win every match and yet not tiring himself out?I rather wish that he hadn’t played Suttgart but he did so we will have to wait and see. One win against Dimitrov don’t make a summer 😆 although I’ve not seen Djoker play yet to know he sharp he looks. Grigor in joke form of late, wins WTF then just bombs. Good point Ryan about turning around the 3rd set tb results. Jonathan, the Kudla match at Indian Wells…was that 2012, Fed wearing a blue polo, beat Isner in the final? A horrible virus swept through the valley and many players, coaches, fans, etc got very sick. Or 2013, Fed wearing orange? Why is Roger playing so early? Don’t recall too many times he played so early. 2;30 am for me, so forget it. Hope his legs and energy hold out. Ye 2012 vs Kudla, fun match, quite close for a set and a bit. Haha. I was there, I remember that match now. 2nd round, Fed looked like hell. The best match of that tournament was Raonic.,,,tie breakers. Eating pasta at 9:00 am : he’ll love it, once again ! Court level footage of Roger from yesterday. Nice footwork. Fed got the widest split step of all the top players I think, very wide base. I must say I am worried before Wimbledon because Federer isnt palying that great. Yeah his winning and thats the most important but when he meet someone better then he wont get away with it. Last week in Stuttgart he actualle played better so lets hope he finds his Agame with a bit of rest. He starts next monday at noon I think. But if he was easily winning sets we’d have people commenting saying he’s peaking too early and this is very bad news for Wimbledon! It’s too easy to break Roger so far in Halle. Man, I don’t need this $hite! How come this old dude be so sadistic with us fans? Angry, clumsy, irritated and still he stings the breakpoint at the right time and wins the deal. I’ve always had perfect blood pressure and a healthy heart, but for how much longer? Hahaha! I’ve updated my expectations after the Paire match. Actually enjoyed this one. Kudla played solid, Roger had his flashes of brilliance. Some super-cheap errors but I tried to laugh instead of crying. Better this way. I thought Fed played pretty well all told. Was tough to break the guy but raised his level when he needed to, got himself out of jail 0-40 down at one point and took his chances when they came. Moved pretty well and the backhand looked vicious at times. I enjoyed it. @rakheshpm Yeah, clown comments. Notre Dame was a metaphor for the rest of western culture. It's falling to bits.